What happens when you undergo a root canal treatment? Home What happens when you undergo a root canal treatment? Root canal treatment is the removal of a bacterial infection that has entered the pulp of your tooth. It is a procedure performed by your dentist to repair and rescue a severely damaged and infected tooth. The acid produced when the bacteria from plaque and sugar from the food debris combine, can wear down the tooth enamel thus resulting to cavities or dental decay. These cavities can cause dental infection and if left untreated, may progress to other structures of the tooth, like the tooth pulp. The pulp of the tooth contains nerve and blood vessels. Any damage to these structures may lead to bacterial infection of the pulp tissues which can lead to tooth abscess. Tooth abscess is characterized by throbbing pain and swelling of the gums surrounding the infected tooth and sometimes, fever may be also present. Other reasons as to why the pulp of your tooth may be damaged and infected are: chipped or fractured tooth, repeated dental procedure and a blow to the face. Infection to the pulp of the tooth is treated with antibiotics and pain killers are used to alleviate the discomfort experienced. 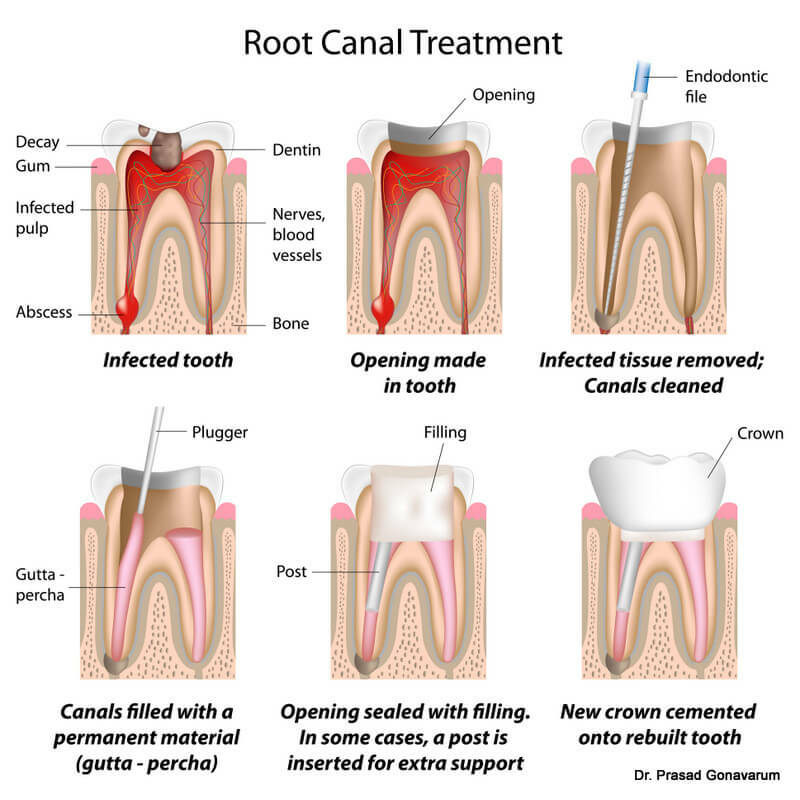 Root canal treatment is advised by your dentist to remove the infected pulp tissues. Other signs that warrants a root canal treatment are: severe dental pain upon chewing or application of pressure, prolonged sensitivity to temperatures, darkening of the tooth and a recurring presence of a gum pimple. Prior to root canal procedure, your dentist will have to conduct an oral examination to check for signs indicative that you need the treatment; and an x-ray is performed to assess the extent of damage or infection in the pulp of the tooth. Usually the procedure requires one or more dental visits. On your first visit, the dentist will numb the area surrounding the tooth with a local anesthetic. A rubber dam is then placed around the tooth to be treated to keep the area clean and dry. Once the numbness is felt by the patient, the dentist will create an opening on the top part of the tooth and a root canal file is used to clean out infected pulp tissues and shape the canal. Once the bacteria are removed, your dentist will decide whether to proceed with the filling procedure or have it postponed on the next dental visit. The decision usually depends on the extent of the infection the pulp of your teeth. He/she may wait for the next dental visit to permanently seal the canal; in the mean time, he/she may place a medication in the canal and temporary seal the hole in the surface of the tooth. This is done to keep out unwanted particles to enter the canal. In some instances, the dentist may choose to permanently seal the canal and the exterior hole the same day it was cleaned. On your second dental visit, the temporary seal is removed. A rubber compound and a sealer paste is used to fill the entire root canal and a dental filling is used to seal the hole created in the surface of the tooth. To complete the restoration procedure, a dental crown is placed over the treated tooth to protect it. It is important that you follow your dentist post-op instructions to ensure the prompt and correct healing of the root canal treated tooth. What you should do after a root canal procedure?